The first time I knew about the brand Chica y Chico is from Wishtrend. Honestly, apart from their super exaggerated advertorial images, I do not know much about this Korean brand. The products available at Wishtrend always look quite interesting though. They also have an official page >>here<< where you can check for all their product range. 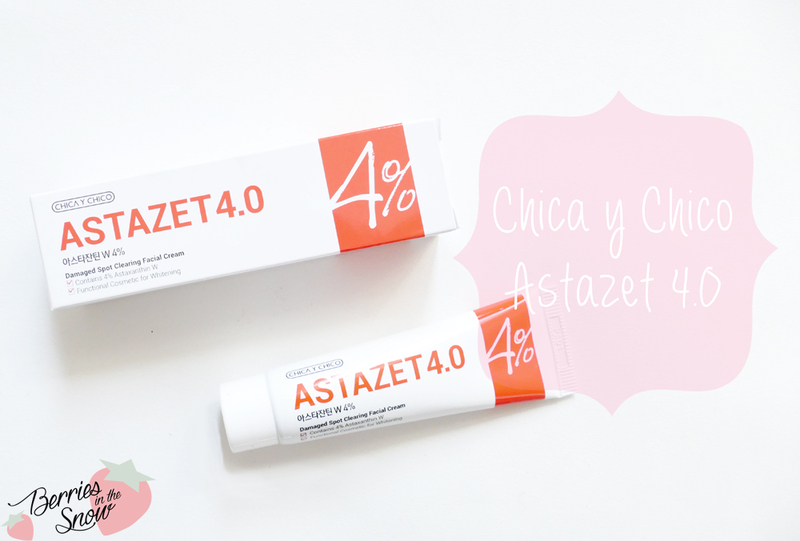 The Chica y Chico Astazet 4.0 is a cream in a series of functional skincare creams. Each cream targets a specific problem, so the Chica y Chico Astazet 4.0 contains as key ingredient Astaxanthin and has whitening and mark care properties, but there is also the Beta-Salic 2.0 (chemical peeling containing Betaine Salicylate), the Retinolin 3.0 (wrinkle care containing Retinol Q), the Tota-S 3.0 (acne care containing Totarol), the Tre-Hy 8.0 (moisture care containing Trehalose), and the Suntana 8.0 (sunscreen). I’ve also tried and used the Chica y Chico Retinolin 3.0 and the Beta-Salic 2.0, but the reviews are still upcoming. All these functional skin care products have a similar style in their packaging: They are simple and clean in their design, each of the products has a signature color. The Chica y Chico Astazet 4.0 has an orange signature color. There is a thick orange bar where the percentage of the key ingredient is written on, which is 4 % in this case. The tiny tube containing 30 ml comes in a cardboard box. 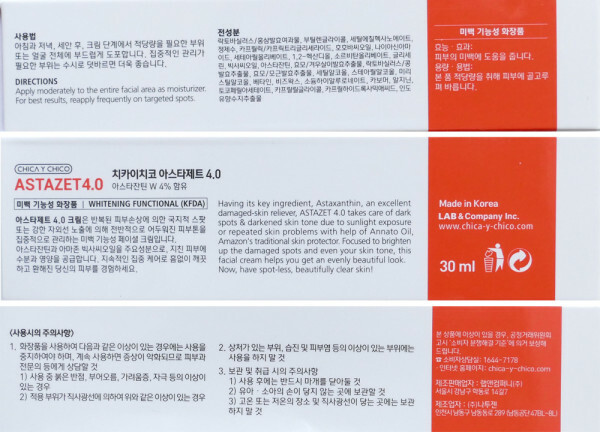 Mostly, the information on the box is written in Korean, but some of the description and the direction is written in English, too. I used this cream every morning as my daily moisturizer for around 3 months. As the directions suggest, I applied a small amount all over my face, then reapplied the cream on my main focus areas. On lazy days I only applied one layer. You can find the ingredients of the Chica y Chico Astazet 4.0 on COSDNA. The key ingredient of the cream is the Astaxanthin, as I mentioned before. This ingredient is a strong antioxidant, so it helps the skin to recover from sun-induced damages by influencing the Melanin activity. 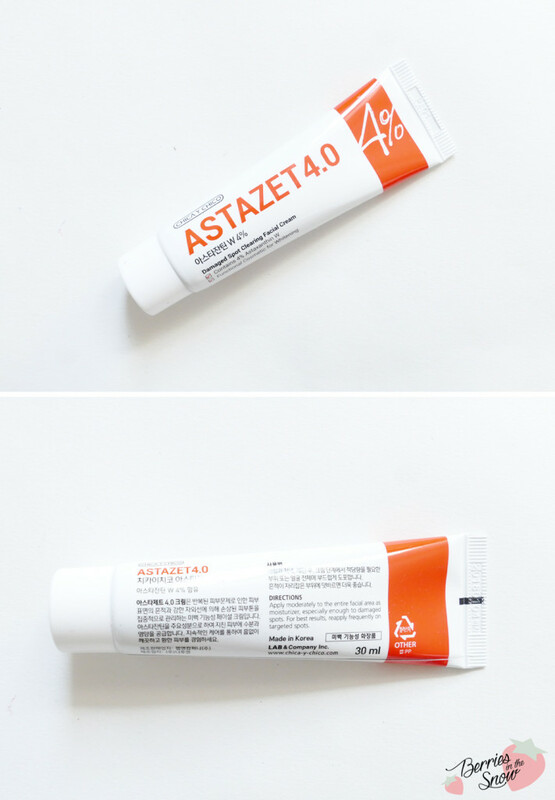 According to the description of the product, Astaxanthin is 100 times more effective than Vitamin C or E. apart from the Astaxanthin the cream contains fermented extracts from different plants, Niacinamide, and extracts from a tropical plant called Urucum, which also is supposed to protect the skin from sun damage and oxidative stress. Generally, the ingredients look quite nice, but I will advise you to check the ingredients lists anyways, just in case there are any irritant ingredients for you. The Chica y Chico Astazet 4.0 has a thick consistency and a yellowish color. It spreads thickly, so I would advise you not to put too much on your skin at once but work it into your skin in layers. Once absorbed it leaves the skin matte and doesn’t peel, doesn’t feel sticky and doesn’t look greasy. The finish is nice to work with during the daytime and it didn’t cause me any problems using my other products or makeup. Speaking of other products, of course, the before and after results, I’m showing below is a result of the combination of products I’ve been using within the last three months. Also, keep in mind that the time I took the images are in summer (before image) and fall (after image), that means that my skin color may also have changed due to the lack of sun for example. My main target where my sun spots/ freckles, which I have for more than a year now. 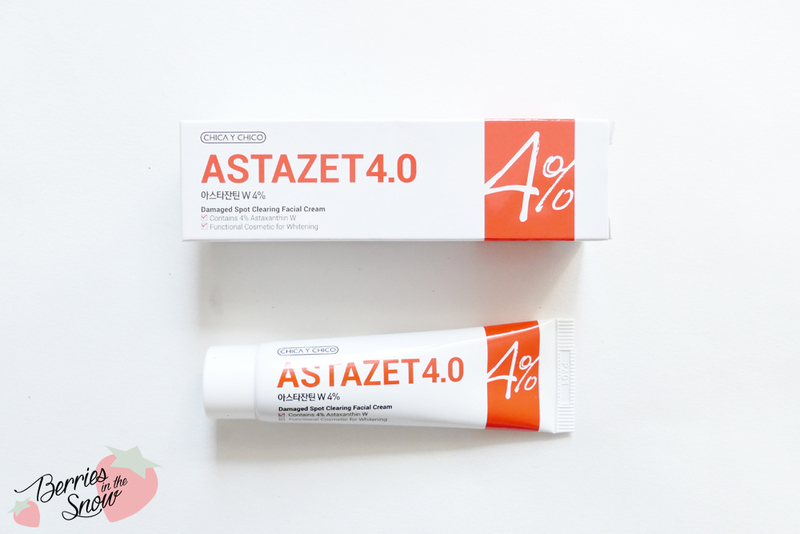 You can see that the color of the freckles has been faded within the last months of using the Astazet 4.0. My general skin color has also brightened up. 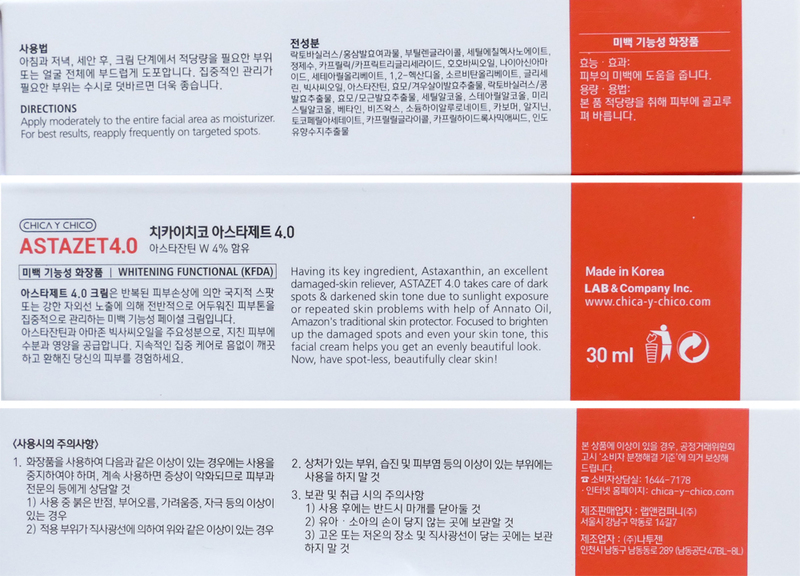 Apart from the Astazet 4.0 cream I’ve been using regularly Vitamin C serum (which I’m using for a very long time, so the changes are not caused by the vitamin C serum), Tosowoong Syn-Ake Natural Pure Essence and Missha’s Time Revolution The First Treatment Essence. These products have surely contributed to my skin brightening, but they are probably not responsible for the fading of the freckles. Do I recommend the Chica y Chico Astazet 4.0? Yes. Will this cream give you guaranteed results? I cannot say since skincare is affecting every skin type differently! But there is a chance that your skin reacts similarly to mine. When you have a look at the ingredients you will see that it contains good and potentially effective ingredients and using anti-oxidants on your skin has never been a wrong idea after all. If you are interested in trying the Chica y Chico Astazet 4.0 you can get it from Wishtrend for 18.68 US$. You can check out my posts on the monthly Wishtrend coupons in order to get some extra benefits when shopping on Wishtrend. Also, keep in mind their friend-referral program: You can receive a 5 Us$ referral coupon if you use my invitation code 17939205 upon registration and you’ll receive this voucher immediately. There will be a specific field in your registration form called “friends invitation program” where you can put the code mentioned above. This way new customers can save 5 US$ which is a great possibility to save some money. It’s really too bad that it’s so hard to tell which product is doing the lightening/brightening work when there are so many things going on in your/(our/my) routine! :O I’m glad you liked this one though and thanks for the up close and personal product shots. Skincare products with outstanding claims are so hard to test! I really appreciate your before and after photos though even though its hard to tell which products the effects are attributed to. Kim last post…Skincare Tips to withstand the Australian Summer! Great post! 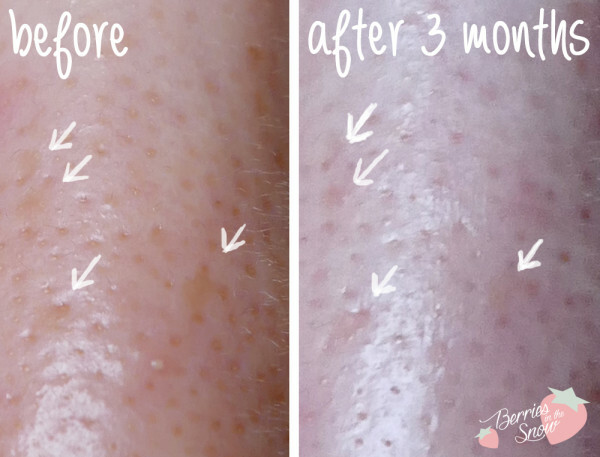 You are using such great products that also help to fade imperfections and brighten so it is hard to pin point which product is doing the most :) I have a sample of this and I might try to apply it just on one of my spots. Do you have reviews for the Retinolin 3.0 and Tota-S 3.0 ? I used the retinolin cream and liked it a lot. But I haven’t written any review for it. For the Total-S I had some samples, but I don’t remember how they performed.